I was remiss last week when I failed to mention Glasgay in my weekend post. Running from 9 October to 9 November, Glasgow's celebration of LBGT culture is now in full swing. I've seen some fantastic films and live performances as part of Glasgay over the years - I would consider the festival to be unmissable. And this year, Glasgay turns 20. 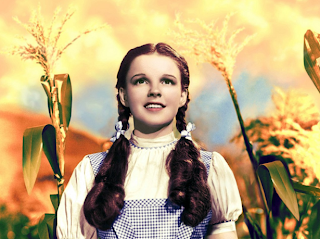 This weekend events include a showing of the Wizard of Oz with live music accompaniment by the RSNO at the Glasgow Royal Concert Hall and Ballet Blue Burlesque presented by Club Noir. You can also check out I Am… - an exhibition at the Virginia Gallery, reflecting on the experience of being LGBT. If you're a fan of beer, head out to Glasgow Green for Oktoberfest and 'party like you're in Bavaria'. The celebration of beer, music and bratwurst will be running from Thursday 17 to Sunday 27 October. Aye Write is presenting a literary strand as part of the Scottish Mental Health Arts and Film Festival at the Mitchell Library this Friday and Saturday. Writers involved include Don Paterson, Sathnam Sanghera, Denise Mina, Sophie Hannah, and girl-e Glasgow favourite, Alasdair Gray. A full programme is available on the Mitchell Library website. It's festival madness here in Glasgow this month. October also sees the launch of the Creative Mackintosh Festival. The festival started on the 12th, but will be running strong until the 27th. From live music at the Willow Tea Rooms to a taste of Japanese culture at the Scotland Street Museum, this festival celebrates the work, of influences on, and work influenced by Glasgow's most famous architect. The Burrell has a special exhibition of impressionists and post impressionists until January 2014, including works by Dega, Manet, Rodin, Cezanne, Pissarro, Renoir and Gauguin. The exhibition includes more than 40 works, displayed together for the first time.